Goldstar is a rapidly growing manufacturer and supplier of customized writing instruments servicing over 5,000 specialty advertising distributors across the United States & Canada. 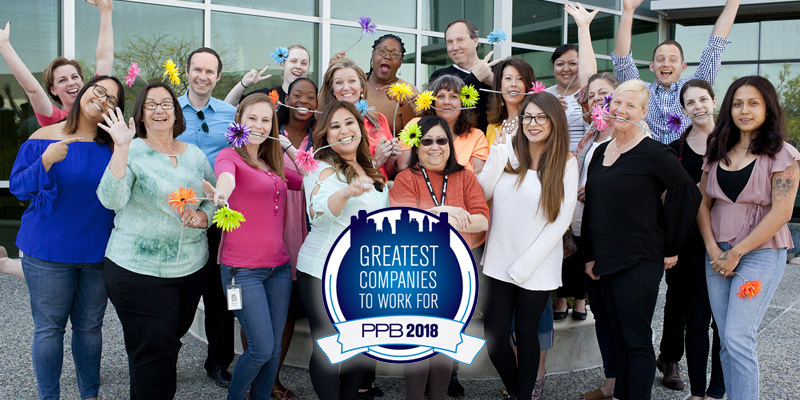 Voted one of the Greatest Companies to Work For by PPAI in both 2017 & 2018 we are looking for enthusiastic individuals who have a love for helping people and going above and beyond for clients. We offer a competitive rate plus bonus, benefits, free coffee bar, a newly updated facility and a friendly atmosphere! Goldstar Headquarters – San Diego, CA 2018. Pictured (from left to right) – Lindsay Preston, Norma Ramos, Susan Lacombe, Andy Crabtree, Megan Price, Cindy Winberry, Tina Morrow, Tracy McNeill, Victoria Schmitz, Yolanda Hill, Perla Ajoste, Chere Givens, Howard Cubberly, Jane Favish, Maria Contreras, Stephanie Pacheco, Gina Wycoff, Sara Bumb, RJ Hagel, Amanda Givens, Cynthia Gonzalez. Not pictured – Kenny Ved, Charles Duggan, Alicia Dierking, Rob Baumgardner, Parker Melvin, Jefferson Baniqued, Tina Vanhoogstraat, Lydia Flowers, Lori Walker, Abbey Hendrix, Jon Roberston, Rachel Hunt, Francisco Burgos, Jessica Gonzales. Processing orders received from distributors from all over the US & Canada for custom imprinted products. Processing and reviewing Customer Care/Orders and General Account assignments. Ensuring all customers and sales managers can depend on Account Coordinators as their key contact for complete order cycle. Answering questions in a timely manner and keeping a positive and helpful attitude when handling requests from clients, and sales staff is of upmost importance. Managing customer e-mails/faxes, handle order entry into Oracle, initiate authorized returns, tracers, order status, out of stock notifications, customer changes in a timely manner with complete accuracy. Working with customers to create art layouts, ensuring art requisitions are complete, follow art through to production, communicating directly with the customer for final approvals. Working with Credit & Collections on accounts providing order copies and/or documents. Working with both Factory liaisons to research issues that may contribute to customer credit due to production issues, inventory, freight quotes, pre-production samples, customer complaints, returns and/or special requests. Strong ability to multi-task in a fast paced, high volume environment. Ability to work in a very fast paced environment with attention to detail. Must be a team player and have excellent e-mail and verbal communication skills.